November 12, 2015 – One year since Philae made its historic landing on a comet, mission teams remain hopeful for renewed contact with the lander, while also looking ahead to next year’s grand finale: making a controlled impact of the Rosetta orbiter on the comet. Rosetta arrived at Comet 67P/Churyumov–Gerasimenko on August 6, 2014 and after an initial survey and selection of a landing site, Philae was delivered to the surface on November 12, 2014. Attempts to arm the thruster the night before failed: it is thought that a seal did not open, although a sensor failure cannot be excluded. Then, on landing, the harpoons themselves did not fire. Despite the unplanned bouncing, Philae completed 80% of its planned first science sequence before falling into hibernation in the early hours of November 15 when the primary battery was exhausted. There was not enough sunlight in Philae’s final location at Abydos to charge the secondary batteries and continue science measurements. 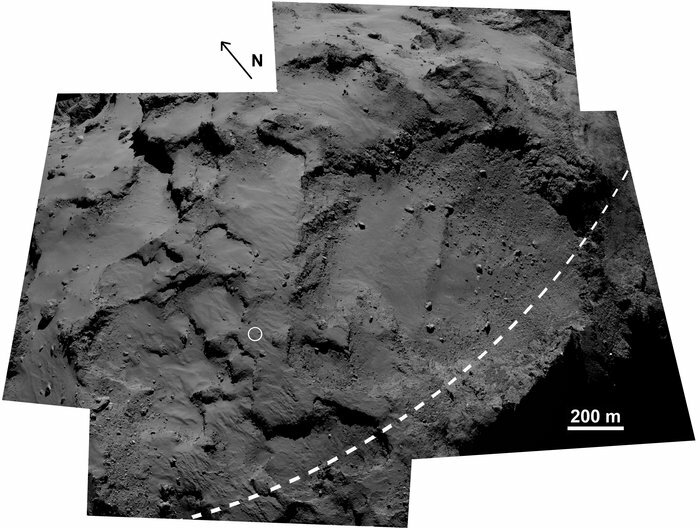 The hope was that as the comet moved nearer to the Sun, heading towards closest approach in August, there would be enough energy to reactivate Philae. Contact was made with the lander on June 13 but only eight intermittent contacts were made up to July 9. The problem was that the increasing sunlight also led to increased activity on the comet, forcing Rosetta to retreat to several hundred kilometers for safety, well out of range with Philae. In the meantime, the lander teams have continued their analysis of the data returned during the contacts in June and July, hoping to understand the status of Philae when it first woke up from hibernation. The team is taking this new information into account to determine the most promising strategy to regain regular contact. But it’s a race against time: with the comet now heading out beyond the orbit of Mars, temperatures are falling. “We think we have until the end of January before the lander’s internal temperature gets too cold to operate: it cannot work below –51ºC,” adds Koen. Meanwhile, Rosetta continues to return unique data with its suite of instruments, analysing changes to the comet’s surface, atmosphere and plasma environment in incredible detail. The plan is to end the mission with a ‘controlled impact’ of Rosetta on the surface. This idea emerged around six months ago, when an extension of operations from December 2015 to September 2016 was announced. The solar-powered Rosetta will no longer receive enough sunlight to operate as the comet recedes from the Sun, out beyond the orbit of Jupiter on its 6.5-year circuit. It will travel even further out than during the previous 31 months of deep-space hibernation that ended in January 2014. In addition, as seen from Earth next September, Rosetta and the comet will look very close to the Sun, making the relay of both scientific data and operational commands very difficult. The Rosetta teams are now investigating the maneuvers needed for operating close to the comet in the weeks leading up to the dramatic mission finale. “We are still discussing exactly what the final end of mission scenario will involve,” said Sylvain Lodiot, ESA’s Rosetta spacecraft operations manager. “It is very complex and challenging, even more so even than the lander delivery trajectory our flight dynamics teams had to plan for delivering Philae. 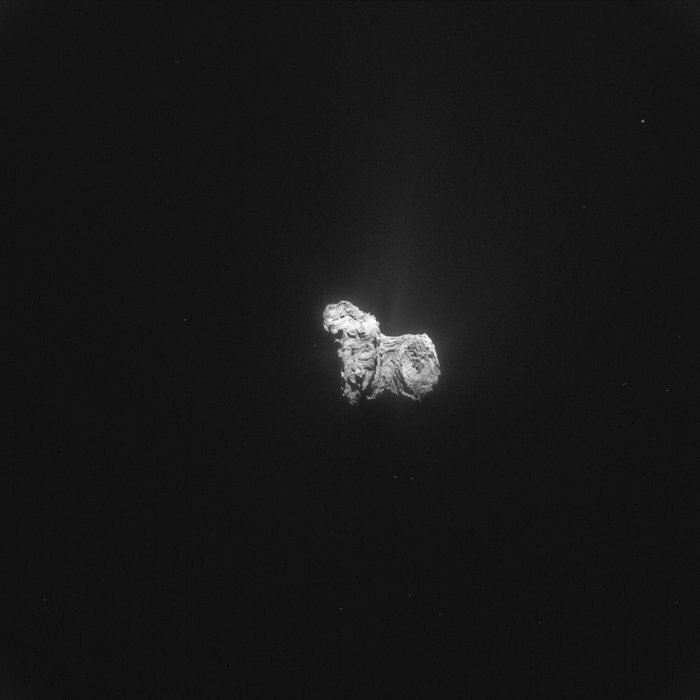 It is expected that science observations would continue throughout and up to almost the end of mission, allowing Rosetta’s instruments to gather unique data at unprecedentedly close distances. “We’ll control Rosetta all the way down to the end, but once on the surface it will be highly improbable that we’ll be able to ‘speak’ to it anymore,” adds Sylvain. “Landing Rosetta on a comet will be a fitting ending to this incredible mission,” said Patrick Martin, ESA’s Rosetta mission manager.